Preventing Dog Bites by Learning to Greet Dogs Properly FREE for one month only – take advantage! Dr. Sophia Yin is a veterinarian and behaviourist and over the years, she found that because pets don’t understand spoken language, they rely on body language plus desired or undesired consequences in order to learn. This means that humans must be aware of their movement and actions because every move they make while interacting with the pet influences the animal’s behavior and perception of them. Dr. Yin has put together this excellent E-book that you can download for free for a month, in order to learn to understand your dog better and prevent dog bits. Friends of the Dog would like to thank Dr. Yin for allowing us this special opportunity. A sincere THANK YOU, from Scotty & Charmaine Why not also take this opportunity to visit Dr. Yin’s outstanding website and read more about her and her wonderful work below. Dr. Sophia Yin knows what it's like to have a problem pet and nowhere to turn for professional help. And she has witnessed countless fractured relationships between misunderstood pets and their frustrated humans companions. Ever since she was a child, Sophia wanted to be a veterinarian, and in 1993, her dream came true. But once out in private practice, she quickly realized that more pets were euthanized due to behavior problems than medical ones. She went back to school to study animal behavior, and earned her Master's in Animal Science in 2001 from UC Davis where she studied vocal communication in dogs and worked on behavior modification in horses, giraffes, ostriches, and chickens. During this time she was also the award-winning pet columnist for the San Francisco Chronicle. Upon receiving her degree focused on animal behavior, Dr. Yin served for five years as a lecturer in the UC Davis Animal Science Department. Through these and an eclectic collection of other animal behavior experiences, she came to realize the true secret to successful behavior modification. Sophia learned that every pet needs a human who can lead. Not like a boss, but like a partner in a dance—someone who gives clear signals, rewards desirable behavior as it occurs, removes rewards for inappropriate behavior immediately, and sticks to the plan consistently until the new, good behavior is a habit. She found that because pets don’t understand spoken language, they rely on body language plus desired or undesired consequences in order to learn. This means that humans must be aware of their movement and actions because every move they make while interacting with the pet influences the animal’s behavior and perception of them. Sophia’s dedication to helping people communicate with pets in a positive, scientifically sound way has led her to create a variety of exceptional books and products for pet owners and pet-care professionals who also aspire to bond with their pets on a whole new level. 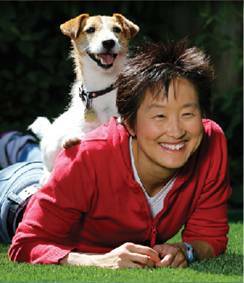 Dr. Sophia Yin currently sees behavior house calls, works at San Francisco Veterinary Specialists (www.SFVS.net), writes for several veterinary and popular magazines and has consulted for several zoos. She also lectures and teaches workshops internationally on animal behavior and low stress handling and has served as a behavior expert for shows such as Dogs 101 on Animal Planet. She is also on the executive board for the American Veterinary Society of Animal Behavior, the American Association of Feline Practitioners (AAFP) Handling Guidelines Committee, and the American Humane Association (AHA) Animal Behavior and Training Advisory Committee.